I think it's the pregnancy, but I am definitely more addicted to Pintrest than usual. Some would say I am "nesting". Regardless, it has led to some fantastic projects finally getting done. I have replaced a number of the window coverings in the house, and am finally putting to use many of the amazing auction finds that I have been collecting. I have a wonderful old trunk, and have been scratching my head with what to do with it. 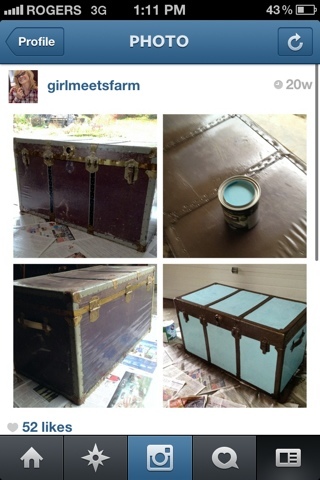 It's too far gone in terms of refurbishment - but then I saw a painted trunk on Pintrest. I hadn't thought to paint it! I posted this photo to my instagram, so apologies for the bad photo quality - but I think it came out quite good!